Green collar 1P1 and mate were observed at Beemer’s Pond near Webster City, IA on Nov 27th 2010, then at Magness Lake, AR on Jan 14, 2011. 1P1 is a 2007 hatch year female from Lake Wapello State Park released at Holla Bend NWR (6 S Dardanelle, Arkansas) on 1/24/2008. Additional swans left Beemer’s pond during the same time period when the winter snow and cold set it. 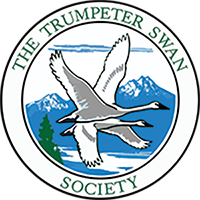 It is hoped that the departing swans were led south to Arkansas by an experienced traveler, 1P1, and were able to learn new migratory routes. 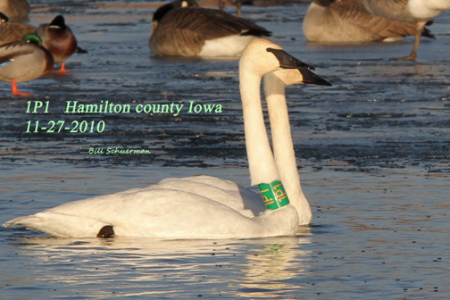 Iowa collared swans reported out of state continue to trickle in from Missouri, Kansas, Illinois, Arkansas, Oklahoma and Kentucky.